As ancient Rome evolved so did the ancient Roman food habits, growing with the passage of time as transition was made from kingdom to republic and then finally to empire. Additionally, as the empire expanded, outside influences also became manifested, particularly the influence of the Greek culture. These cultural influences not only included the eating habits but also new cooking methods. With the growth of the empire, just like every other domain of life, the eating habits were defined by the class disparities of the society. At the initial stages of Roman history, there were not large differences between the food of the rich and the poor. However, as Rome expanded and as the culture became more refined, the differences between the upper and lower classes became more marked. After 301 BC, the influence of Greek cuisine habits came to manifest itself on Roman culture more clearly. Growing wealth in society led to more sophisticated eating habits among the upper classes and it soon gave rise to a peculiar culture in ancient Roman food choices. 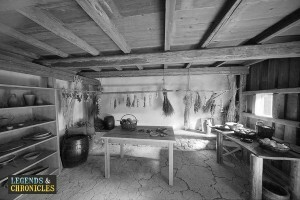 A Roman farmers kitchen where food would be prepared. A wide range of recipes were consumed by the Romans and some of them are consumed today. For instance, Columella Salad was the kind of salad consumed among the rich and its ingredients included fresh mint, fresh coriander, fresh parsley, small leek, fresh thyme, salted fresh cheese, vinegar, pepper, and olive oil. Another famous ancient Roman food was the Roman Burger which consisted of minced meat, French roll soaked in white wine, freshly ground pepper, salty fish sauce, stonepine kernels, green peppercorns, Caroenum, and baking foil. Some other popular Roman recipes included chicken and leek, big shrimps, boiled veal, steamed lamb cutlets, honey and nut dessert, and grape and nut desert etc. The traditional Roman breakfast was called ‘ientaculum’ and it was served at dawn. Then at around 11 am, a small lunch was eaten and finally, the main meal of the day called ‘cena’ was consumed in the evening. With the passage of time, consumption of foreign food increased and this also increased the variety available for ‘cena’. The food items consumed by the common Romans included cereal grain as porridge or bread. For breakfast, egg, cheese, and milk were used in addition to bread. While for ‘cena’, various vegetables could be consumed along with bread. The ingredients of these meals varied between the upper and the lower classes. The Roman upper class was called the patrician class and its food habits were quite different from those of the common people. There were certainly common ingredients such as a variety of wheat in addition to barley and oats. But the emperor and the patricians had a wider variety of food at their disposal. The rich also made lavish use of vegetables and fruits in their daily meals. These vegetables and fruits included cabbage, carrots, radishes, lettuce, pumpkin, mushrooms, grapes, apricots, dates, apples, pears, and others. An important feature that distinguished the meal of the upper classes from lower classes was the constant and essential presence of fine wine on the dining table of the rich people and the emperor. Meat and fish dishes were also available for the upper class Romans. Other ingredients included honey, dried fruit, boiled eggs and olives. An example of typical Roman fruits and vegetables. The most important ingredients of food in ancient Rome for peasants and slaves was porridge and coarse bread. Sometimes, vegetables were also consumed and in rare cases, meat could be used too. Although the daily diet for slaves was guaranteed, it was just about enough to sustain them. Other than bread and porridge, the slaves could get vegetable soup and cheap wine. The slaves who were also gladiators had to eat a diet rich in carbohydrates which included such elements as vegetables, legumes, and grains. Meat was relatively expensive and thus the peasants and slaves rarely ate it. Slaves were sometimes given horse and donkey meat because this kind of meat was considered inferior by the wealthy people in Roman society. Roman soldiers naturally required meals that were high in calories in order to endure the rigorous physical demands of their duty. The Roman soldiers were either engaged in battles or when not on the battlefield, they were busy in training activities and manual labour. Important ingredients of the food for soldiers included grains such as corn and wheat, meat which typically consisted of bacon, cheese, salt, and wine. Often, soldiers also received various fruits, different types of nuts, and honey. A variety of popular beverages were consumed along with food in ancient Rome. For instance, one of the most popular beverages was called Calda. It consisted of warm water and wine laced with spices and was typically consumed in winter. Posca was another popular beverage which was made of vinegar mixed with sufficient water to make it drinkable. This wine, however, was rather coarse and was reserved for soldiers and slaves. Another famous wine among the upper class Romans was Passum which was a strong and sweet raisin wine. The Romans always mixed water with wine and never drank it straight. 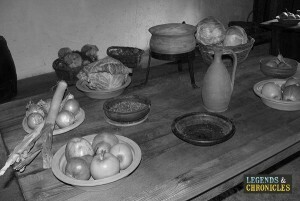 Various recipes were used to make wine. One such recipe was called ‘conditum paradoxum’ which consisted of a mixture of wine, honey, pepper, laurel, dates, mastic, and saffron. Ancient Roman food had a wide variety of ingredients including various fruits, vegetables, meats, and wines. However, this variety was mainly reserved for the upper class Romans known as patricians while the common people called plebeians had limited scope of ancient Roman food. One of the most common ingredients of Roman food was bread which in case of lower class was rather coarse. Slaves were dependent on their masters for their food and were sometimes ordered to go and hunt for their own food. A variety of Roman food recipes were prevalent, some of which are still eaten today.